This Bacon Asparagus Cajun Pasta is out of this world. I know because I was having a heck of a time photographing it without eating it. 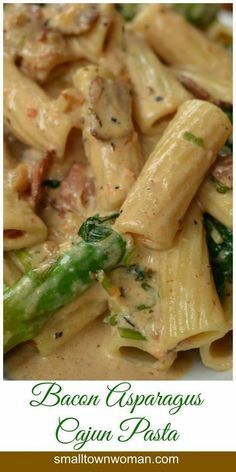 This creamy dreamy pasta is loaded with all kind of goodies…bacon, asparagus, garlic, spinach and a creamy Cajun Parmesan sauce that is to die for. If you don’t like spinach substitute some mushrooms but you would add them to the pan about 2-3 minutes after adding the bacon to the pan. 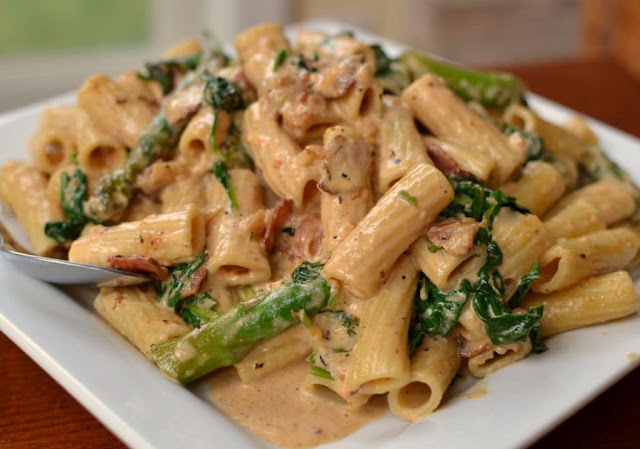 This Bacon Asparagus Cajun Pasta is a must try. We absolutely love it and we hope you do too! Cook pasta according to box instructions and drain well. In large skillet over medium heat add bacon pieces. Cook for 8 minutes. Add asparagus and cook for 8 minutes. Reduce heat and add garlic and cook for 1 minute. Add spinach and cook just until slightly wilted. Remove to plate. Using same skillet pour in wine scraping bottom to remove browned bacon bits. Add cream, Cajun spice and simmer to desired thickness stirring frequently. Remove from heat and slowly add Parmesan cheese and stir until melted and smooth. Add bacon/asparagus mixture and drained rigatoni. Serve immediately. You need to use fresh grated Parmesan not the stuff that comes in the can. That contains non-clumping additives that will not allow your cheese to melt correctly. 0 Response to "Bacon Asparagus Cajun Pasta"